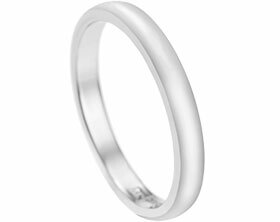 Neil’s palladium wedding ring features stepped engraving that flows around the whole ring to create a sense of movement. The tunstall finish gives the ring a sparkly feel without the need for diamonds and highlights the engraving beautifully. As Neil is not used to wearing jewellery, he opted for a reverse D profile for a comfortable fit.